Everyone at the Statehouse was singing Kumbaya this week over the idea that Indiana should pause A-to-F school accountability as a result of the more demanding ISTEP exams that students took last spring. Gov. Mike Pence announced that he was in favor of holding schools harmless for any drop in their grades. House Speaker Brian Bosma and Senate President Pro Tem David Long issued a statement saying they were on board with the plan. So did Democratic Superintendent of Public Instruction Glenda Ritz, who declared her “strong support” for Republican-sponsored legislation to suspend school grades for the year. Their vehicle of choice is Senate Bill 200, authored by Sen. Dennis Kruse, chairman of the Senate Education Committee, and scheduled for a committee hearing Wednesday. The measure says the State Board of Education, which issues grades for schools, can’t give any school a lower grade for 2014-15 than it received for 2013-14. The school grades are scheduled to be announced this month. Kruse’s approach sounds reasonable. ISTEP scores plummeted in 2015 as a result of a shift to new state standards and a tougher test, and school officials across the state insist the resulting grades aren’t fair. But it will be terribly disappointing if the state board doesn’t report the scores that schools would have received if accountability weren’t paused. At the very least, the public should know how much difference the testing changes made – and for which schools. We can expect that much transparency. Remember that Ritz first called for an accountability pause a year and a half ago, knowing the new test would produce lower scores and worse grades. But Pence and legislative leaders would have none of it. Their attitude started to change this fall when it sank in that over a quarter of Indiana schools could receive Ds and Fs. It’s an election year, after all, and the prospect of hundreds of thousands of parents, teachers and community members outraged that their previously exemplary schools would now struggle to get a passing grade … Well, it’s bound to concentrate a politician’s mind wonderfully. It really says something when the conservative Indiana Policy Review publishes a lengthy article that essentially declares Indiana’s charter school experiment a failure. Especially when the article’s author, Timothy P. Ehrgott, is a longtime school choice advocate who helped found one of the state’s first charter schools and was director of the Educational CHOICE Charitable Trust, a privately funded voucher program. But Ehrgott looks at the data and concludes that, after 12 years, Indiana charter schools aren’t doing what their advocates promised: producing better results with greater efficiency than public schools. Judging by the state’s A-F school grading system, he shows that public schools perform better than charter schools, even adjusting for location and for student poverty and race/ethnicity. The question almost asks itself: Why fund charter schools as alternatives, when the existing schools are doing not only as well, but, as we’ve seen, much better? Indeed, the results presented here are so lop-sided as to call into question not only any increase in the number or funding of charter schools, but perhaps even the wisdom of continuing to fund the majority of charter schools in our state. Let’s be honest. If a medical study of a drug produced these kinds of results, with many more adverse outcomes than positive ones, the project would be shut down. Ehrgott’s analysis is similar to one that I did two months ago, but he goes into considerably more detail; he also adds information on the history and philosophy of charter schools. He hits on the high points of the article in a newspaper column distributed by the Indiana Policy Review Foundation. Despite his disappointment, Ehrgott isn’t actually ready to end the charter school experiment – or maybe he just recognizes that isn’t going to happen. Instead he says Indiana authorities should get serious about accountability: Shut down charter schools that get Ds and Fs, intervene with those that get Cs and put an end to “authorizer shopping.” He also suggests offering more ways for charter schools to pay for facilities and letting their students ride to and from school on public school buses. I wasn’t going to write about how Indiana charter schools fared this year under the state’s school grading system. But then Gov. Mike Pence released his 2015 legislative agenda, which calls for doubling down on charter schools and vouchers. So here goes. We’ve had charter schools for over a decade in Indiana, and there’s no evidence they are better than schools run by public school districts. They aren’t a magic bullet. Some charter schools are effective and some aren’t. Just like your local public schools. And when measured by Indiana’s school grading system – which the governor likes to cite in calling for more high-quality schools — charter schools aren’t better. Looking at all schools in the state, there’s a huge gap. 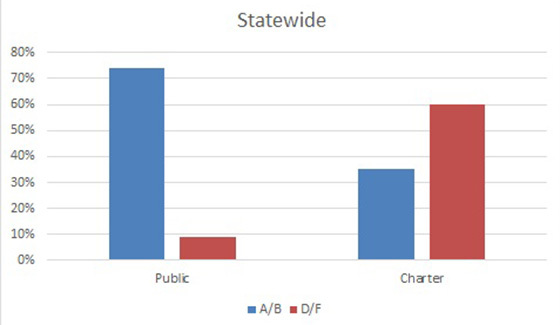 Among all public schools*, 74 percent were awarded an A or B, and only 9 percent got a D or F. Among all Indiana charter schools that received grades, only 35 percent got an A or B and 60 percent got a D or F. (Fifteen charter schools were not graded, typically because they were new and couldn’t show student growth on test scores). High-poverty schools made impressive gains in the 2014 A-to-F grades that the Indiana State Board of Education released last week. So did other schools. Across the board, a lot more Indiana schools earned As and Bs and a lot fewer were labeled with Ds and Fs. But the performance of schools serving the neediest children jumps out. Among the quarter of schools with the highest percent of students qualifying for free or reduced-price lunches, 30.2 percent earned As. Nearly half got As or Bs. Just a year ago, only 20 percent of schools in that category got As. The year before that, just 12.7 percent of high-poverty schools got As. That’s real progress. It’s still true that school grades reflect students’ socioeconomic circumstances. Indiana’s grading system, especially for elementary and middle schools, is based largely on students’ performance and individual growth on test scores. And research shows that test scores correlate with poverty. Looking at the grades, you get the impression it’s nearly impossible for a low-poverty school to get a C or worse. And by low-poverty, I don’t mean just Carmel and Fishers. In the quarter of Indiana schools with the least poverty, up to 36 percent of students qualify for free and reduced-price lunches. Schools in the highest-poverty group were still as likely to get a D or F as an A. 65 of the 73 schools that got Fs were in the highest-poverty quartile. More than 90 percent of the most affluent quarter of schools got an A or B. My obsessive quest to uncover the whole story behind the 2012 Christel House Academy grade-change saga has apparently come to an end. And not a happy one. One year, one month and 22 days after I filed a public-records request, the Indiana Department of Education responded. “After review of your records request, it was determined the Department does not maintain the records you are requesting,” legal assistant Leslie-Ann James said via email. The request was for certain DOE staff emails concerning the A-to-F school grading system that was being rolled out in 2012. The goal was to figure out when and why the department got rid of a “ceiling” on the points schools could earn for English or math test scores or student growth. This has never been explained to my satisfaction. Remember that Associated Press reporter Tom LoBianco unearthed DOE emails last summer that showed then-Superintendent of Public Education freaking out because Christel House, a highly regarded Indianapolis charter school, was going to get a C under the new grading system. Department staff scrambled to make changes, and Christel House ended up with an A. Officials decided to ignore test scores for the school’s high-school students. But that only pushed its grade to a B. A year ago this week, I filed a public-records request with the Indiana Department of Education. I’m still waiting to see if I’ll get what I asked for. Kelly Bauder, a state DOE staff attorney, admitted this week that the department has been running behind on responding to a trove of records requests. Two employees who were working on the task left the department, she said. A new legal assistant has been hired and is learning the ropes. “We’re hoping to get caught back up in the next couple of weeks,” she told me. My request was for copies of departmental emails from 2012 concerning changes in the state’s school grading system. The objective is to tie up a loose end to a story. Last summer, Associated Press Reporter Tom LoBianco disclosed DOE emails showing how former Superintendent of Public Instruction Tony Bennett and his staff scrambled to tweak the system so Christel House Academy, an Indy charter school run by a Bennett political supporter, would get an A instead of a C.
Those emails showed the department decided not to count the performance of Christel House’s 9th and 10th-graders for accountability purposes. That boosted its grade from a C to a B. How did it get to an A? Thanks to Cynthia Roach, director of assessment for Indianapolis Public Schools, we learned the other change: getting rid of a “ceiling” on points awarded elementary schools for math or English test scores.